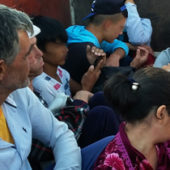 Executive summary: Despite the official denial of forced labor and the existence of laws that prohibit the use of forced labor, the government of Turkmenistan continues to subject a significant part of the population to forced labor. 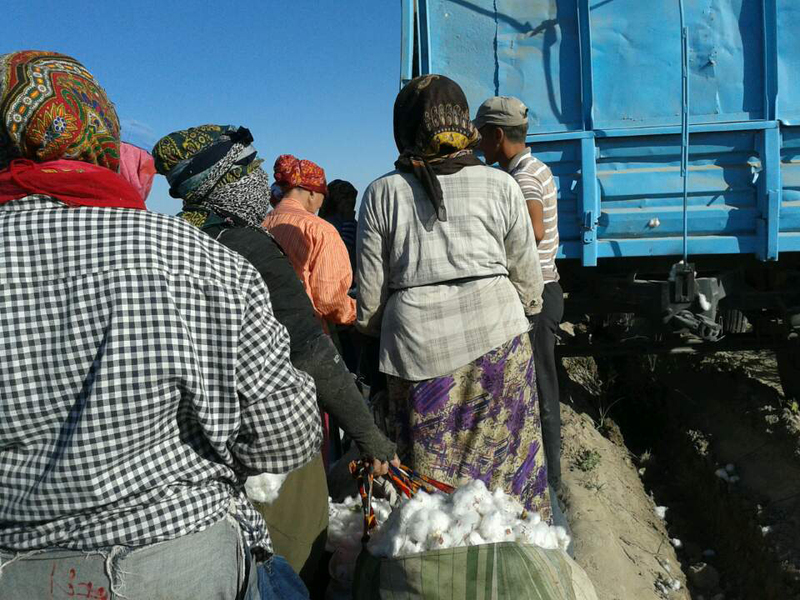 Last fall, the Alternative Turkmenistan News (ATN) reported at length on forced labor in Turkmenistan during its cotton harvest. ATN described in detail how tens of thousands of civil servants (including school teachers, doctors and employees of various state enterprises) were forced, under the threat of dismissal, to spend four months (from late August until late December) in the cotton fields. The working and living conditions of the forced laborers were abysmal, with people often having to sleep in the open air, drink ditch water and bathe in irrigation channels. From the start on August 20, this year’s cotton harvest has varied little from those of the past few years: civil servants are forced en masse to harvest the “white gold” by the government of Turkmenistan. By forcing citizens to harvest cotton, Turkmen officials on various levels are violating the International Labor Organization’s Convention №105 on the abolition of forced labor and Convention №29 on forced and compulsory labor. Furthermore, with this practice the government of Turkmenistan is violating its own Labor code, section 8 of which defines forced labor as «any labor one is forced to do against his will under the threat of some form of punishment, to which one did not agree to voluntarily». The daily quota for the collection of cotton is established at 20-50 kilograms per person. Those who refuse to go to the fields or who do not meet this standard can expect dismissal from their jobs, public reprimand or other forms of punishment. For example, teachers are threatened with a shortening of their work hours, which reduces their income. Several teachers suffered such punishment last year, and the impact is aggravated by high unemployment of up to 60% (CIA World Factbook). The most vulnerable are manual laborers, who value their jobs the most. Custodians, orderlies, guards, stewards, stevedores and warehouse workers realize that if they refuse to go to the cotton fields, they will be fired, and there are many unemployed ready to take their place. Therefore, no one grumbles; everyone does what the boss demands. The first sent to the fields were residents of rural areas. After a week on the cotton plantation, civil servants from the cities began to arrive. Those who work for organizations without their own buses gathered at pick-up locations at six o’clock in the morning. The bus arrives at seven, and the people are at work in the fields by eight o’clock. After President Gurbanguly Berdymuhamedov chided the Lebap regional government for the slow pace of the cotton harvest, it has been all hands on deck. Lebap regional officials are scrambling to finish the harvest before the beginning of the Conference of the Council of Elders, scheduled for October 20 in their region. Mukhammet Dzhoraev, the region’s governor, ordered his subordinates to waste no time fulfilling their regional quota, at a meeting on September 16. Municipal workers, mainly street cleaners, are the most vulnerable to being used as forced laborers. They refer to themselves as “slaves without rights.” While officially all of the workers of the regional and city municipalities report to their own ministry, these simple workers have plenty of other “supervisors.” Any low level official can phone the head of municipality and ask to send over “a few people” to do some private work. Such a relationship to municipal workers is found in the capital and in regional centers, but the most distorted forms of lowering human worth appear in the rural centers, where the level of unemployment is higher than in the cities. Municipal workers of the Balkan region in western Turkmenistan have it especially hard because the region is considered a resort area. Over the past few years billions of dollars have been invested in it, particularly in the city of Turkmenbashi and in the Avaza zone on the shore of the Caspian Sea. Avaza is a pet project of the president himself – he is a frequent guest there – with both national and international events often being conducted there. Therefore, local authorities demand that the tourist zone always be clean, and are quick to force the Balkan municipal workers to conduct tasks well beyond their contractual duties. The custodians of the Balkan region, in particular laborers at the Cheleken municipal enterprise, are required to spend the majority of their time on work trips, and pay for their travel and meals on their own. The workers of this enterprise are sent all over the territory to provide custodial services: to Kara-Kala (410 km), Bekdash (450 km), Kazandzhik (270 km) and other population centers of the Balkan province – and even beyond its boundaries. 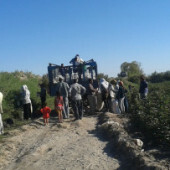 In December of 2013, about 20 of these laborers were sent to the capital Ashgabad with an “important” mission: to dig holes for the following spring’s planting of fir-trees. The standard was 300 holes per person during the work trip. The ordinary laborers spent the winter nights outside in tents. Nearby, the foremen slept in enclosed trucks. The workers were transported in slow-moving trucks, and the 557 km drive from Ashgabad to Cheleken took almost twenty hours. Due to the cold temperatures and extended trip on board the truck, all of the “passengers” returned home sick. On assignment in the city of Kazandzhik (now called Bereket), workers (mainly women) of the Cheleken municipal enterprise were forced to apply pesticides to winter wheat seeds. They slept out in the open, had access only to irrigation channels for water, which are likely contaminated with the pesticides, and had no personal protective equipment or safety training. The workers ate whatever they could afford to buy for themselves, often soup with eggplant for lunch and dinner – the least expensive item at the local vegetable stands. The women of Cheleken municipal service were forced to carry and pile garbage into the hills that make up the city landfill, where machines should be working. 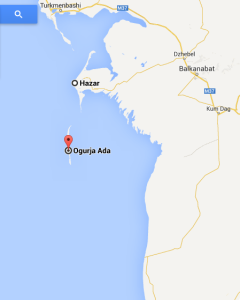 They removed trash from the small towns of Kheles and Avaza. For this work excursion they pay for their own rooms, meals and travel. The Cheleken municipal workers are surprised that they often are sent to clean up other cities when their own city needs no less attention. The city is dirty and the local beach is referred to as a minefield after swim season ends. The people, if they even ask about such things, know there is only one answer: “You don’t like it? Write your letter of resignation!” Therefore no one complains. 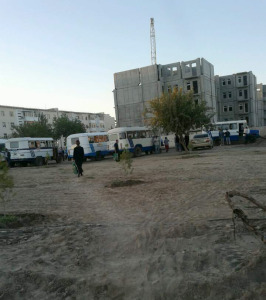 There were not even complaints when they were sent to pick up grass at a radioactive waste storage facility without gloves or any equipment, as happened in June of 2012 when about 100 workers of the capital city’s heating company “Ashteplo” were sent to an area called “Nine Ashgabat Commissars,” a radioactive waste site. It is important to note that a requirement by the employer to the employee to perform work duties in the absence of system of collective or individual protection or when the execution of the required work is likely to endanger the life or health of the worker, is also defined as forced or compulsory labor by Turkmenistan’s Labor Law (Paragraph 8). The same paragraph states that longer working hours without appropriate remuneration is also considered forced labor. When the cotton harvest begins, the first to be called to the fields are precisely these municipal workers. Last year the government decided not to plant cotton in the Balkan region, and many residents in that area breathed a sigh of relief – ‘no more cotton.’ But, that was not quite the case. 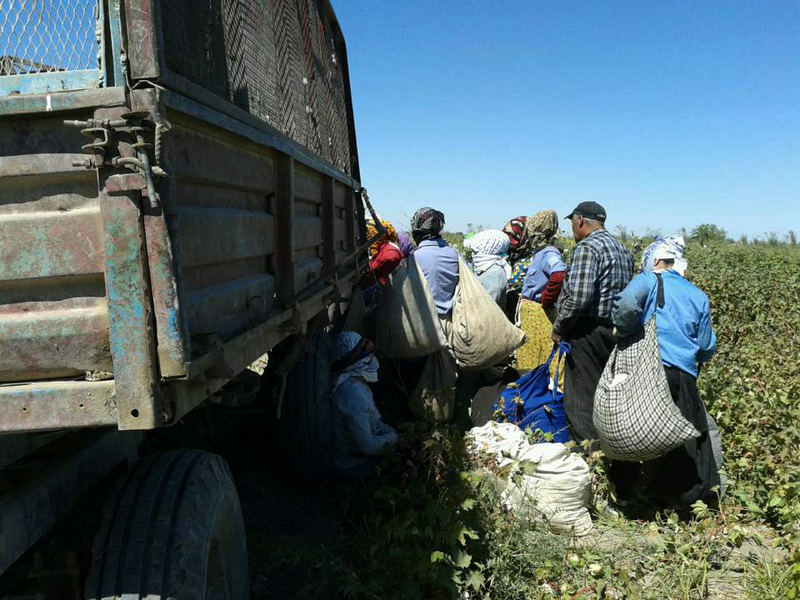 At the end of the harvest, authorities sent municipal workers on a month-long assignment to pick cotton in the Akhal oblast. We are seeking the details on the mobilization of these workers for this year’s harvest. Every year municipal workers from other regions are also sent out to harvest cotton, for a month, and even longer. 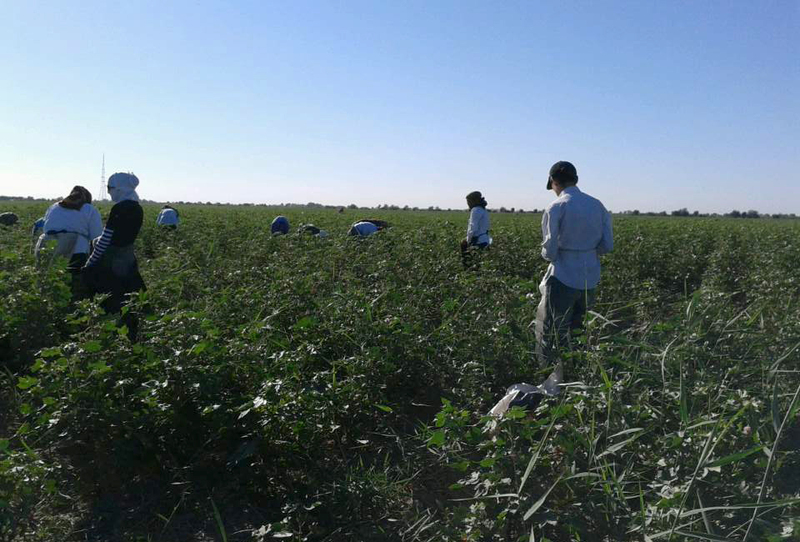 In the Lebap region this year, workers of different municipal units were sent out again as last year to harvest cotton in the new Dovletli area, where there is not sufficient manpower for the harvest. As of September 15, the daily minimum was set at 50 kg per person, and many were able to meet this because there is a lot of cotton in the fields of this region. Last year we wrote in detail about their living conditions during the harvest and, in particular, about people drinking ditch water and bathing in irrigation ditches. This year conditions have noticeably improved for them: land renters feed the people a hot meal once a day, and not just gruel, like last year, but cooked meat with various side dishes. Along with this, the land renters have been regularly filling jugs of drinking water for the workers. In the evening, people chip in five manats (less than $2) and go buy groceries at the closest stores in order to make their own dinners, with enough left over for breakfast the next day. Younger workers, generally in their 20s and from the city, bring music players and sometimes in the evenings create a dance club. They go to the cotton in groups that change once a month. Those municipal workers who remain in the city have to do extra work, their own duties and those of their peers mobilized to the cotton fields. 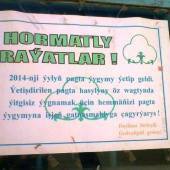 In Turkmenabat, they are busy cleaning up the territory and making improvements to the administrative center of the region for the upcoming conference of the Council of Elders. Now they are widening the roads, putting in borders, replacing power poles, and making sidewalks for pedestrians. Along Bitarap Turkmenistan street, they are installing marble borders, which are cleaned by hand by municipal workers. 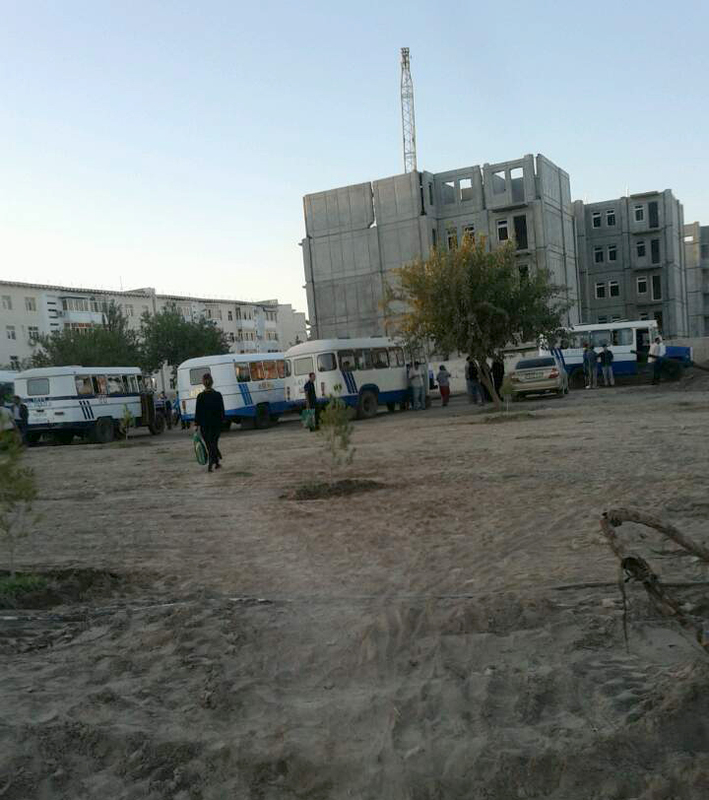 The city also bought two cleaning vehicles that run from four o’clock in the morning on the central streets of Turkmenabad. In the Lebap and Mary regions, authorities forcibly mobilized teachers of the upper grades (7-11). School administrators organized the teachers into groups of 12 to 18, and every day three groups are sent to the cotton fields from morning until evening. The rest go to school and, as much as possible, fill in for their colleagues by conducting lessons in their classes. The next day the groups change. Schools have also mobilized teachers of lower grades (0-4) for the cotton harvest. The lower-grade level teachers are sent every other day, typically after the school day. For them, Sunday is an official day off, while teachers of higher grades are obliged to work in the fields two Sundays each month. For many teachers of younger grades, especially in rural areas, upper-level students go to the harvest in their place: in the morning they go to school and in the afternoon they go to pick cotton. Teachers are paid their normal salaries and for the cotton they pick. In these two regions, just as last year, they earn 20 tenge (seven U.S. cents) for each kilogram of cotton. Many school administrations have demanded that teachers pay for hourly workers or independently hire people to pick cotton in their place. Many do just that – the prospect of working for eight to ten hours in the heat attracts few. But, there are those teachers who, on principle, do not pay the money and go to the fields themselves. Just as last year, it costs between 10 and 20 manats ($3.50 — $7.00) a day to hire a hourly worker, depending on the conditions, especially transportation- one day with a return home or overnight for a long period of time. Most school custodians and watchmen are sent to pick cotton every day. In their place, teachers clean up their classes themselves. In the lower grades, school administrators force parents to pick cotton in order to keep the teachers in the classrooms. There are many unemployed Turkmen citizens who want to be hired for the harvest cotton, when they can earn a decent amount. Under the current system, ordinary Turkmen citizens are paying the unemployed to pick cotton, directly subsidizing the central government to increase its returns on cotton. We wrote in more detail about these hired workers in the first part of last year’s monitoring. In the parts to follow, we will examine the private sector and how entrepreneurs (owners of small and medium businesses, market vendors and private bus drivers) are forced to participate in the cotton harvest campaign.